These directions may void warranties, cause sterility, or just not work. FOLLOW AT YOUR OWN RISK. 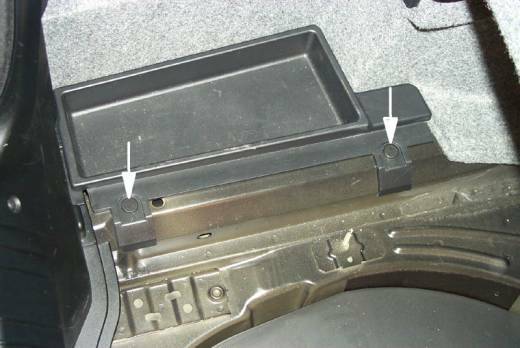 Notes: There are two rivets holding the trunk tray down. Each rivet is actually two pieces of plastic. One is a seat that goes into the hole. The other is a rivet that when pushed into the seat, causes the seat to expand and provide the holding power. I used a flat head screwdriver and slowly pried the rivet away from the seat until and then used needle nose pliers to pull it out cleanly. Step 3 -- Remove the left rear tail light assembly. Notes: I broke this assembly removing it. Don't be like me. In the center of the light is a small tab you pull towards the center of the car and the whole assembly pops off. 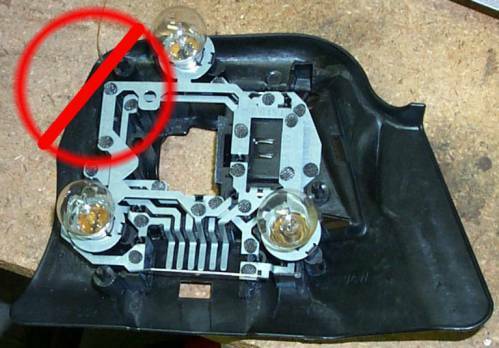 I then used a flat head screwdriver to depress a small tab and removed the wiring harness plug to avoid damaging the light. Step 3 -- Remove the left side rivets. Notes: Other than the color, these are pretty much the same as the last rivets. Notes: Just pull it out. Trust me. It comes out. Notes: It’s a pain but the stuff is semi-rigid/flexible and I pulled the part by the taillight out first. 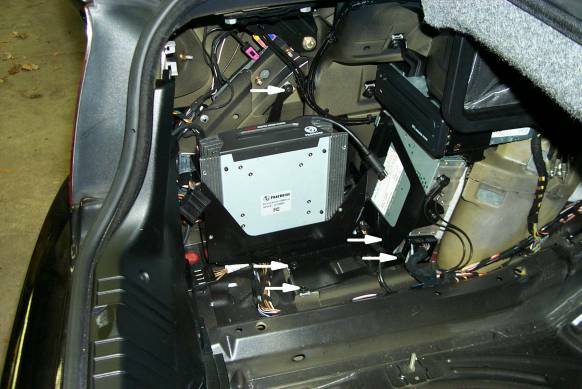 Task 2 -- Remove the bracket for the CD Changer / NAV unit from the trunk. Step 1 – Remove the CD Changer Pre-wired cables that are taped to the CD Changer bracket in a Foam Protector. Notes: Undo the three bolts on the Navigation computer and WITHOUT removing any wires you can then maneuver the unit out of the space and set it just out of the way. Notes: Undo the 5 bolts for the bracket and remove from the car completely. 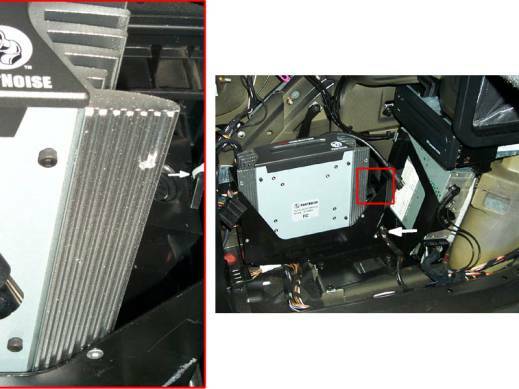 Notes: The PhatBox needs to be mounted as High and as Far back in the car as possible. Simply line it up in the bracket so this will be achieved and mark your drill points with something pointy and sharp. Notes: I used 1/8” Pop Rivets so drill your holes with a 1/8” bit. Step 1 – ATTACH THE BLITZSAFE CABLE TO THE UNIT!!! 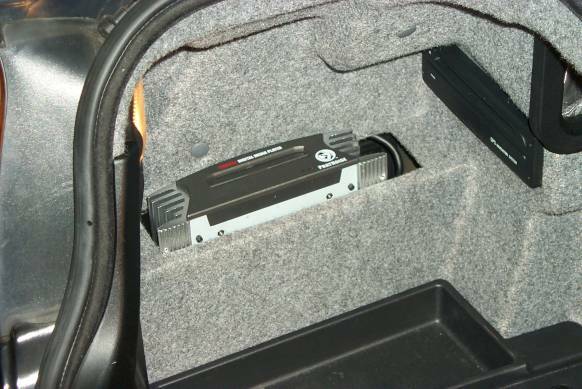 Notes: Once the bracket with the PhatBox is mounted in the car, you won’t be able to reach the cable. ATTACH IT NOW. Notes: I routed my cable towards the back and looped it upwards and back towards the front. Step 4 – Tighten the front most two bolts. 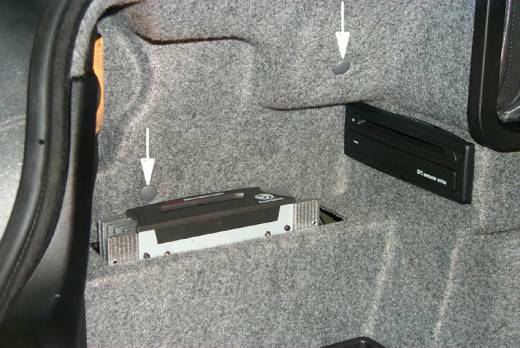 Step 7 – Route the pre-wired CD Changer cables through the hole shown in the photo below. Step 1 – Attach the round cable from the PhatBox to the BlitzSafe converter. Notes: The cable is difficult to plug in all the way and the BlitzSafe is a rather “cheap” part. I braced the converter with one hand from below and carefully inserted the cable. Task 6 – Tighten Everything: Assuming everything worked, it’s time to finalize everything. Step 1 – Put the Foamy/Furry Stuff back. Notes: This was the hardest part of the job. I put the back in first and just worked it so it went over top of the PhatBox and around the NAV CDROM. It took a while to get all the trim back correct but eventually you will be done. Step 3 – Put the tray back with the two black rivets.